A new alignment fixture for the ClipsShop™ CSTEP-2 hand grommet bench press that features a smooth, roller bearing slide for spacing grommets and an adjustable base plate is being introduced by METALgrommets.com of Dighton, Massachusetts. The ClipsShop™ CSTEP-2 Hand Grommet Press is designed for heavy-duty use where automated equipment isn’t required, but speed and accuracy are. It provides a force-advantaged lever with a foam handle and an adjustable stop and can accommodate grommets #XX00 and larger. Featured is a new alignment fixture which has a roller bearing slide with high contrast English-metric graduations, a knurled thumbscrew for adjustment, and an adjustable table. Designed for easy setup and operation, the GrommetSniper™ Alignment Fixture is a rigid fence that lets users uniformly locate the distance between grommets from 2” to 24” (50 to 620mm) to center and application depth from 3” to center. 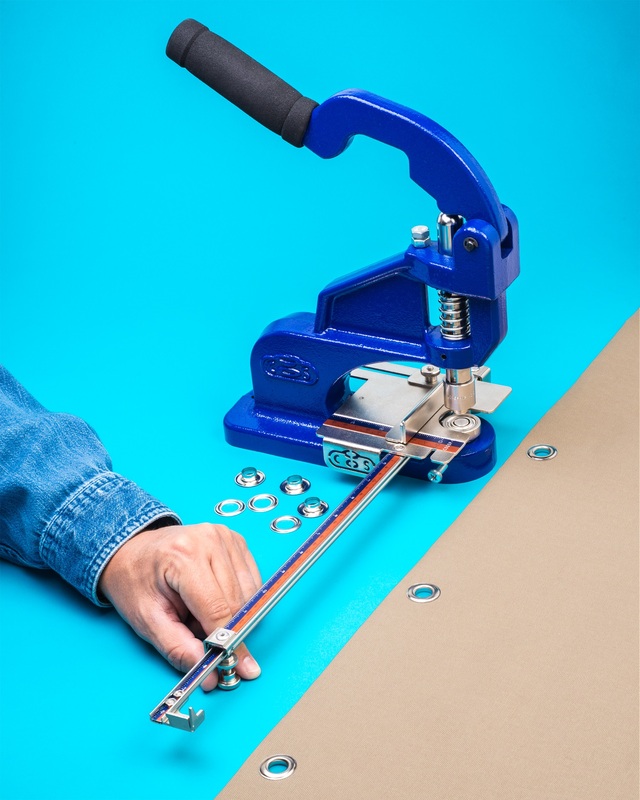 The ClipsShop™ CSTEP-2 Hand Grommet Press is portable, easy to operate, uses interchangeable self-piercing dies, and its adjustable bottom stop prevents crushing and assures a consistent grommet application. The ClipsShop™ CSTEP-2 Hand Grommet Press and GrommetSniper™ Alignment Fixture are priced from $209.95 including dies and metal grommets.